Going to try and get my blog going again. I find winter makes it particularly difficult for me to feel motivated to take photos, but now that it’s “spring” again, I’m going to try to keeps the posts coming. I also just got back from a vacation in Puerto Rico and the British Virgin Islands, so I have several travel photos to work through. Our first bit of vacation was three days in Puerto Rico. We were staying in a lovely Air BnB right in the middle of Old San Juan. One of the sites all of wanted to see was the Castillo San Felipe del Morro, which luckily for us was a 5 minute walk from where we were staying. While we were looking through the fort, we found several iguanas just chilling. The one in the photo below was sitting so close you could practically reach out and touch him. 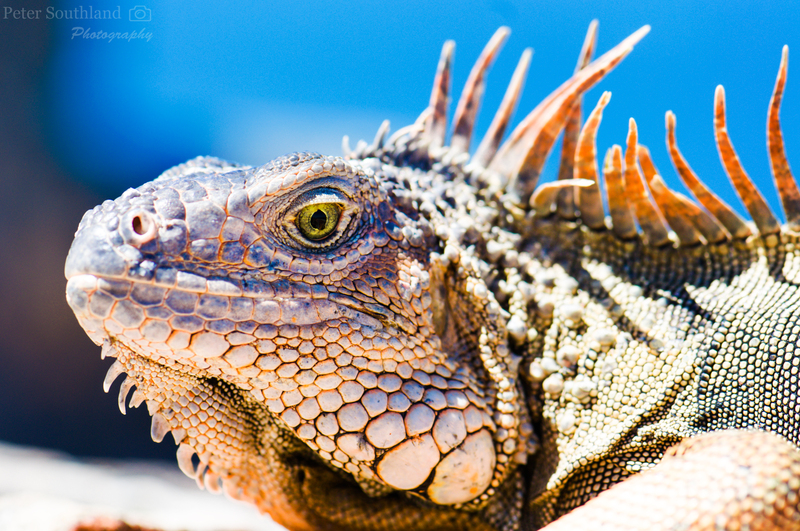 For this photo I really wanted to focus on the iguana’s eyes. To accomplish this I used my macro lens, since it would let me frame the photo without getting too close to the iguana. By setting the aperture to 6.3, I was able to have the eye, face, and body largely in focus while still blurring out the background. If I had used a wider aperture, the eye would still be in focus but some parts of the face and the body would have also been blurred out like the background. Great photos though I don’t like lizards. Fantastic photo! Do you find some of your photos are cropped when you download them onto WordPress? I’m new to WordPress. Had a comment from someone saying my photos don’t look like they are loading properly. I also use a Nikon, the D7000. I haven’t noticed any issues with my photos loading incorrectly. Nice iguana! The eye is nice and sharp, and the colours have rendered very naturally too..
Love the lizard – wow!